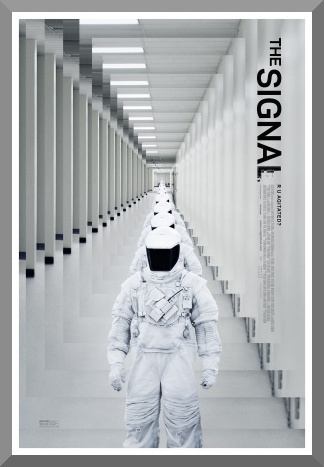 The Signal is a pretty good movie, except for when it’s not. It is very clear that the film’s co-writer and director, William Eubank, has a very interesting story to tell, and much of it comes through, but much of it also doesn’t, somehow missing. This movie is 97 minutes long, and it feels like it’s missing five or ten, where the story connects a little bit better, but the twists and the themes remain, ready for the post-viewing thought and discussion which would be a little more fun if the presentation had been polished up a bit more from a plot perspective. The plot centers around two MIT students – Nic (Brenton Thwaites), and his best friend Jonah (Beau Knapp). They are traveling across the country, along with Nic’s girlfriend Haley (Olivia Cooke), driving to and dropping her off at her university. When Nic and Jonah begin to communicate with a nameless, faceless hacker named Nomad, who has proved in the past to be, to put it lightly, intriguing, the trip’s purpose soon changes, with the group heading to Nevada, Nomad’s presumed location. However, upon their arrival, here is little of note to be found at first. An event occurs, and Nic loses consciousness, awaking in a strange research facility, with Haley in a coma and Jonah seemingly only accessible by talking to him through the air vents. The facility is headed up by Dr. Wallace Damon (Laurence Fishburne), donned, like the rest of the lab’s employees, in a Hazmat suit, and making it very clear that he won’t be providing any real answers to Nic anytime soon. In the last paragraph, I mentioned Eubank’s 2011 debut, Love. Along with being similarly cryptic in its themes as well as covering a wide array of subjects and ideas, it also suffers from the same main problem that The Signal does, although the specifics of where and how the issue manifests itself are a little different. In Love, we had many concepts, but they weren’t fully elaborated. In The Signal, Eubank takes fewer concepts and allows more time for expansion, but there’s less synchronization, a moment of clarity where it feels like you have been properly provided with the information the movie wants to give you. I can’t reasonably call The Signal a very good movie at all – its advantageous ideas are sometimes sloppily put together around its plot, and feels a bit rushed amidst the revelations that come at the very, very end. However, I still wish to recommend it, by a hair, because you should support independent movies with unique thoughts and otherwise solid executions, even if there are some story problems to get through. William Eubank proves once again that he is a good filmmaker, and if he should combine the best qualities of his projects so far, he has the capacity to create a truly great film, but he hasn’t quite made it yet.